Sun-Dried Tomato Pizza - A recipe from Savor California, the online showcase for extraordinary gourmet foods and beverages from California. The Perfect Bite has generously given us one of their popular recipes. Roll out dough to desired size. Combine capers and pesto. Spread onto pizza. Combine Fontina, Quattro Formaggio, and crumbled goat cheese. Sprinkle evenly onto the pizza. 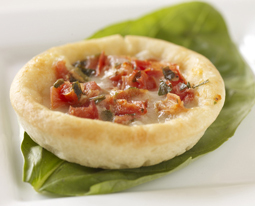 Bake at 350°F for 20 to 25 minutes, or until the crust is lightly browned and cheese is melted.